IT IS A tactic that is becoming more widespread in hurling but don’t expect the market leaders to start reverting to it. Kilkenny have been the All-Ireland champions for the past two years and began their 2016 campaign in convincing fashion last Saturday when defeating Dublin. But does Jackie Tyrrell ever see Kilkenny going down the sweeper route? “No, the kitchen is the only place I’ve done a bit of sweeping,” laughed the James Stephens club man. “I would say no, but who is to know? I don’t think it is the Kilkenny way. 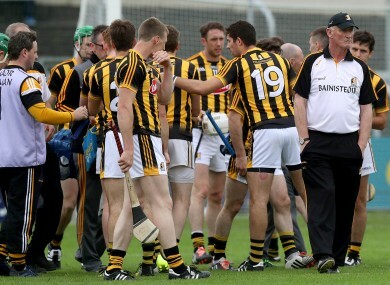 You play to your strengths, I don’t think a sweeper is Kilkenny’s strength. “It might be for other counties. There is a lot of talk out there about sweepers, but nobody was really giving out about it when Clare did it in 2013. “When they won an All Ireland with it, there was nothing said about it. Waterford won a league title, there was nothing said about it then. It only seems to be in the last year. Kilkenny prevent themselves from being opened up at the back by the fact that players further up the pitch retreat at different stages to aid their defensive effort. Eoin Larkin is an example of a player who is nominally a forward but whose manic work ethic is central to Kilkenny’s success. “I suppose other teams pick one person as a sweeper,” outlines Tyrrell. “We would probably say we put all of ourselves there. It can be so amazing if a half forward runs 10 yards to pick up a midfielder’s man. “If you do that you can have so many bodies back. That is the way we work it. Is a worrying trend developing in the game? “It depends who wins the All Ireland this year,” reckons Tyrrell. “If you have a team that doesn’t use a sweeper then that seems to be the way going forward. Some of the games haven’t lived up to the excitement, but then you have games where they have. “The Waterford Clare one, there were sweepers there that day, but for some reasons they were poles apart those two different games. Email “'The kitchen is the only place I've done a bit of sweeping' - Don't expect Kilkenny to go defensive”. Feedback on “'The kitchen is the only place I've done a bit of sweeping' - Don't expect Kilkenny to go defensive”.